E-way bill's failure has led to chaos as businesses are unable to cope with states coming out with their own rules. Harpreet Singh, Partner, Indirect Taxes, KPMG India, was on a post-Budget panel at a TV channel after the finance minister's Budget speech on February 1. But his phone kept ringing as clients - some of them large FMCG companies - told him that the e-way bill portal had stopped working and they could not generate the electronic receipt that the trucks with goods were supposed to carry. Businesses were clueless for hours as their trucks remained stuck in the absence of e-way bill receipts. An e-way bill is an electronic receipt under the goods and services tax (GST) regime for movement of goods, both inter- and intra-state. It is an anti-avoidance mechanism under which no goods worth more than `50,000 can be transported outside or within (beyond 10 km) the state without this electronically generated bill. Though e-way bill on inter-state transfer of goods was made mandatory from February 1, 16 states, owing to falling GST collections, announced its implementation for movement of goods within the state too. However, on D-day, all came crashing down, as the e-way bill website, maintained by National Informatics Centre, faced glitches. The portal stopped working due to overload. 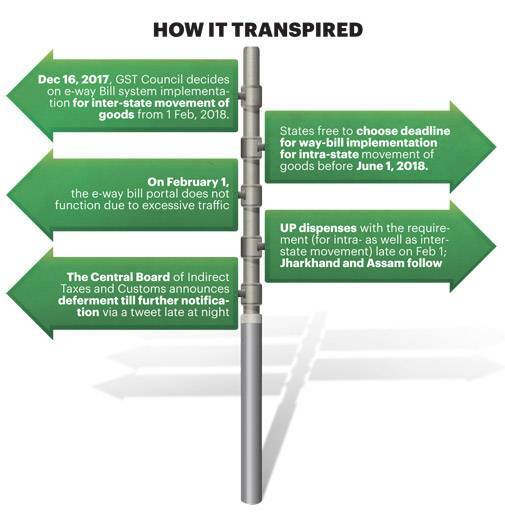 According to GST consultants and transporters, with no immediate resolution in sight, most movement of goods, in some cases even within the states, came to a halt for a few hours on February 1. Rajat Mohan, Partner, AMRG & Associates, says that even as the website stopped working, it was only late at night that the government announced, through a tweet, that the measure had been deferred. "However, there is no legal sanctity of a tweet. The notification came only on February 2, putting brakes on movement of goods on the first day." Giving an example of the problems faced by many, he says a few quick-service restaurants have a centralised kitchen from where they supply food items (mostly perishables) to different branches. "Since the movement of goods was put on hold, these food items could not be sent to the restaurants on time," he says. Jubilant Foodworks, the owner of quick-service restaurant Dominos, refused to speak on the matter. Explaining the reason for the glitches, J.P. Singla, Chief Executive, All India Transporters Welfare Association, says: "Those who were making the rules must have estimated daily e-way bill generation on the basis of the number of trucks that ply daily. However, it seems they were unaware that each truck has 200-300 invoices. Hence, the traffic for the e-way bill generation may have far exceeded their estimate." Some transporters say they had to carry screenshot prints of the reported errors on the portal. But the deferment has not ended the troubles of industry. The chaos has probably just begun. With the central government washing its hands of the mess by postponing the e-way bill indefinitely, each state issued notification for implementation of the e-way bill or any other system that it had before that. After the central government notification, a few states such as Uttar Pradesh, West Bengal, Assam, Himachal Pradesh, Karnataka and Rajasthan issued circulars/directions/tweets that they would continue with existing procedure (as applicable before 1 Feb 2018) for inter-state movement of goods. Now, industry is facing a problem in keeping track of the notifications issued by each state and the different dates and goods on which way-bill would be applicable. For example, on February 5, Rajasthan came out with a circular that in view of the postponement of the national e-way bill, the state would revert to its earlier regime according to which inter-state movement of 33 commodities required way-bills. Gujarat came out with a notification on February 1 saying that the way-bill for intra-state transfer of goods had been suspended till 20 February. "It has become challenging for industry to keep track of state-wise statutory requirements with respect to generation of e-way bill," says Singh of KPMG India. Tax experts say many of these notifications are not even updated on websites for days, leaving industry and tax consultants in dark about the changes. Rajat Mohan of AMRG & Associates says, "The national e-way bill was brought in to unify the process, but now we are back to the same chaotic situation of each state going its own way." With a national e-waybill, one could have generated the way-bill from a single website, but now with each state going its own way, one has to generate it by going on the website of each state. Besides, each state has a different threshold for requirement of way-bill. M.S. Mani, Senior Director, Indirect Taxes, Deloitte India, says all processes under GST were uniform across states and e-way bill was the first instance of state-wise differentiation and businesses did not like it. 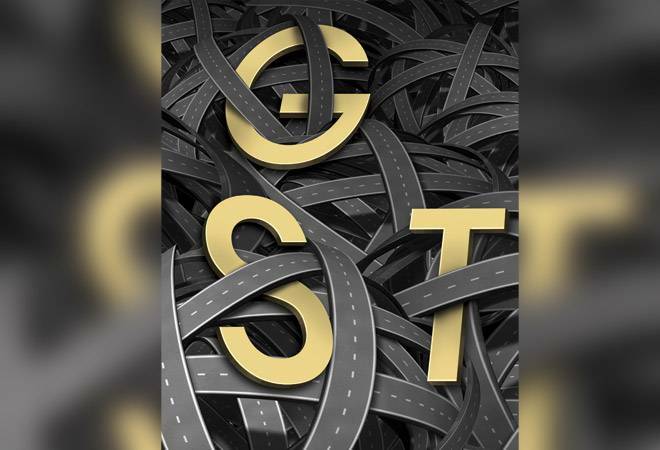 Till the GST Council, which takes all GST-related decisions, comes out with the new national e-way bill date, the ensuing chaos and confusion may further unsettle many businesses already struggling to cope with the frequent changes in GST.